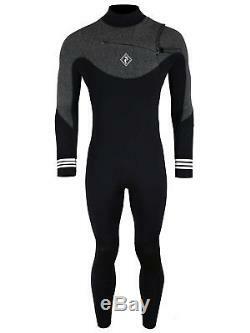 TBF MENS DELTA 5/4MM WINTER WETSUIT. Super soft, smooth super-stretch neoprene. The Men's Delta 5/4mm Chest Zip Wetsuit has an attractive 2-tone design with minimal branding for that sleek and stylish look. Featuring a host of performance features, such as internal garter flaps, hidden chamber drainage and a snug chest -zip entry, this is a super warm and comfortable 5/4mm wetsuit that will boost your performance through the colder months. We've toned, refined and improved our suit range for the new season and with the Delta series you won't even realise your wearing a wetsuit! Of course it is the 100% SCR neoprene in extra thick 5/4mm that makes the headlines with this Mens wetsuit. Ideal for when the water temperature drops to give you the confidence to stay out there longer. The SCR neoprene offers an incredible stretch across the entire suit with a closer, purer fit. Not just a candidate for surfing but an ideal choice for all watersports including kayaking, bodyboarding, sailing stand up paddleboarding and nearly anything. 5/4mm superstretch neoprene for flexibility. Taped seams on arms and legs for added heat retention. YKK chest zipper for reliability. Internal garters for water resistance and warmth. Hidden chamber drainage at front and back. Thermal windroof mesh back pannel for added warmth. Internally-taped stitch tie-offs for durability. The item "TBF Delta Full Length 5/4mm Mens Winter Wetsuit Warm Stretchy Flexible Comfort" is in sale since Tuesday, January 30, 2018. This item is in the category "Sporting Goods\Surfing\Wetsuits". The seller is "two_bare_feet" and is located in Torquay, Devon. This item can be shipped to all countries in Europe, United States, Canada, Australia.